The relationship between grandparent and grandchild is a sacred thing. Those of us who have been lucky enough to know our patriarchs and matriarchs cherish the memories we have of them. And the food. Oh, the food: grub that often we weren’t even hungry for. The cookies they baked (and lowkey ate half of), the cars they drove us around in (so slow, and often in silence, that all we could do was ponder the concept of time) and the tissues they gave us (that always seemed to come out of nowhere). All these things pale in comparison to the most important lesson they ever taught us: hide valuable things in places so safe that even you will forget to check. My grandpa used to hide money in picture frames; I once found a fifty-dollar bill behind one of my school pictures. I confessed to the unintentional theft and was rewarded with the very money I had found behind my own face. I can’t remember what I bought with it—probably a lot of cheeseburgers. If I had found it today, I would put it towards rent… But my memory of my grandmother was the first thing I thought of when I read an article about a Canadian couple winning the lottery thanks to a bookmark. Canadian Nicole Pedneault’s methods of financial security are in line with that of my G-Pa’s. She hid a lottery ticket in a book a year ago. Nicole Pedneault and Roger Larocque bought this ticket last year on Valentine’s Day to shy away from your typical “flowers or chocolate” gifting cliché. 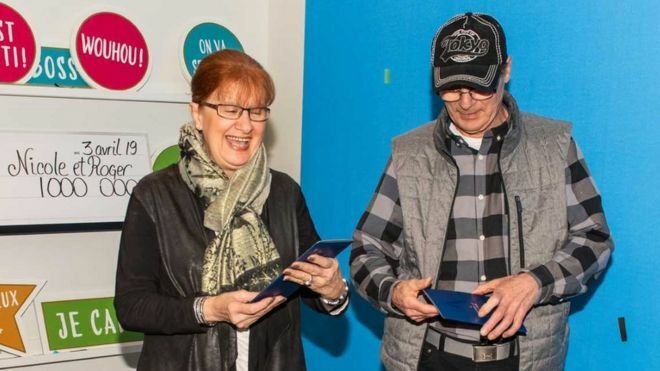 The couple found the ticket days before the deadline to turn it in. Nicole Pedneault’s grandson was preparing a presentation on Japan for school, so she shuffled through souvenirs from a trip she once took to Japan—she wanted to help him with his project. It was in her shuffling that she found the ticket tucked between the pages of a book. She had unwittingly forgotten she hid the ticket there. I mean, who doesn’t use lotto tickets and other random pieces of paper for makeshift bookmarks? “If my grandson hadn’t asked to borrow those items for his show-and-tell presentation, I would never have found the ticket on time,” she said. The original drawing for their ticket was 5 April 2018; lucky for them, winners have a year to claim the prize. Even luckier for them is the fact that this ticket won them one million Canadian dollars (which is roughly… well, not as much in USD). It would seem that the ‘sacred thing’ I referred to earlier has truly paid off for Nicole; however, she will probably not be hiding the winnings in a picture frame. We have no plans to celebrate tonight. We will go to a small restaurant, and we’ll spoil ourselves by ordering poutine, double sauce, and double cheese. Well played. While you guys feast, the rest of us will be frantically flipping through the pages of books we never finished. Featured Image Via Afroditacurlymind Etsy Store.